The strain of E.coli found in the supermarket chicken is not the O157 strain which causes food poisoning and is usually found in burgers. But while the antibiotic-resistant E.coli discovered in chicken does not cause diarrhoea or vomiting, it is feared it stays in the gut for years. If someone later develops an infection, the bug can make them resistant to life-saving antibiotics, known as cephalosporins. A small study carried out by the University of Cambridge earlier this year found that one in four samples of chicken bought from leading supermarkets was contaminated. The most recent government study – carried out by experts at the Department for Environment, Food and Rural Affairs department and Public Health England – was much bigger and found a much higher infection rate. The samples were collected from major supermarkets, convenience stores and butchers, based on market share. These included the big four – Tesco, Asda, Sainsbury’s and Morrisons – and 80 per cent of the meat was labelled as being of UK origin. Campaigners say the emergence of superbugs is the result of the heavy use of antibiotic medicines on farm animals, such as chickens, over decades. In the case of poultry, day-old chicks are effectively inoculated with antibiotics to protect them from bugs. 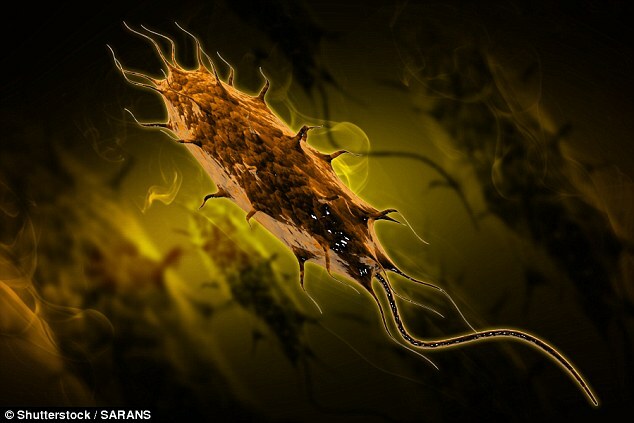 However, bacteria such as E.coli has mutated to become resistant to them, so posing a threat to the human population. Cóilín Nunan, of the Alliance to Save Our Antibiotics, said the Government and the farming industry had failed to respond to warnings about the over-use of antibiotics. ‘For years the poultry industry was systematically injecting day-old chicks in breeding flocks with modern cephalosporins, despite these drugs being classified as critically important antibiotics in human medicine,’ he said. ‘This practice was in breach of an EU Directive, but although we alerted the Government in 2006, the official watchdog, the Veterinary Medicines Directorate, refused to take any action. The Government and food industry say consumers can protect themselves by handling chicken carefully and cooking it thoroughly. But Dr Mark Holmes, reader in microbial genomics and veterinary science at the University of Cambridge, says that is not good enough. Q AND A: WHERE DOES E.COLI COME FROM? Where does E.coli come from? The bug is found in food, principally raw leafy vegetables and undercooked meat. It also comes from touching infected animals or their manure, drinking or swimming in contaminated water and contact with other people who have E.coli. Is E.coli more of a threat than previously? Figures show this potentially killer bug is on the rise, with 9,808 cases from June to September, up from 8,901 two years previously. Deaths from all strains of E.coli are also rising. Why are chicken carriers of E.coli? Chicken have E.coli naturally in their gut, like other farmyard animals. But the poultry industry helps create superbugs by treating their stomach upsets with antibiotics. The Alliance to Save Our Antibiotics wants a ban on systematically giving chicken these drugs before they fall ill, although the industry claims to have voluntarily stopped this. Should I be worried about my supermarket chicken? The antibiotic-resistant E.coli found in chicken, unlike the O157 strain usually found in pink burgers, won’t cause devastating food poisoning. But don’t get too comfortable, because experts warn it could stay in your gut for a decade. If it won’t make me ill straight away, why worry? The alarming effects of the antibiotic-resistant strain of E.coli come when you get ill. Someone infected by chicken a few years earlier, who then ends up having chemotherapy for cancer, or surgery, is vulnerable to infections such as pneumonia, which then cannot be properly fought with antibiotics. What should I do to protect myself from E.coli? Do not wash chicken under the tap before cooking, as this can splash E.coli bugs around your kitchen. Use a chopping board, then put this in a dishwasher if possible, because this is hotter and better at reaching cracks than using the sink. Wash your hands. What should the supermarkets do? 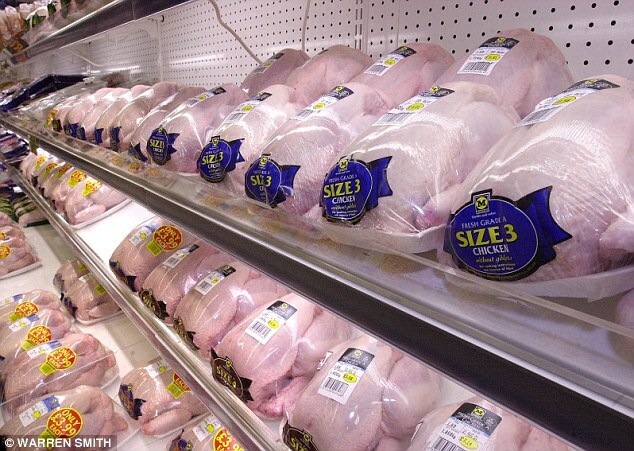 Superbug expert Professor Hugh Pennington has suggested freezing the chicken and thawing it to kill off bugs before it reaches supermarket shelves. Better checks are needed by poultry producers to keep consumers safe. ‘People do get food poisoning and every time someone falls ill, instead of just getting a food poisoning bug they might also be getting a bug that is antibiotic-resistant,’ he said. The country’s Chief Medical Officer, Professor Dame Sally Davies, has sounded the alarm over the rise of superbugs resistant to antibiotic medicines. Last week she said: ‘Drug-resistant infections are a global problem and the potential for human, animal and economic damage is devastating. ‘We need everyone to take action to prevent the spread of drug-resistant infections. Andrew Opie, director of food at the British Retail Consortium, which speaks for supermarkets, said: ‘We are working with suppliers to minimise the prevalence of all bacteria, but customers still need to be mindful of the importance of safe handling and cooking of raw meat at home. The Government released figures last week showing that sales of antibiotics for use in animals in the UK are at a four-year low. Sales for use in food-producing animals dropped 10 per cent, according to Defra. Rural affairs and biosecurity minister Lord Gardiner said British farmers were leading the world in cutting back on the use of antibiotics.